Here is my new mailbox haul! 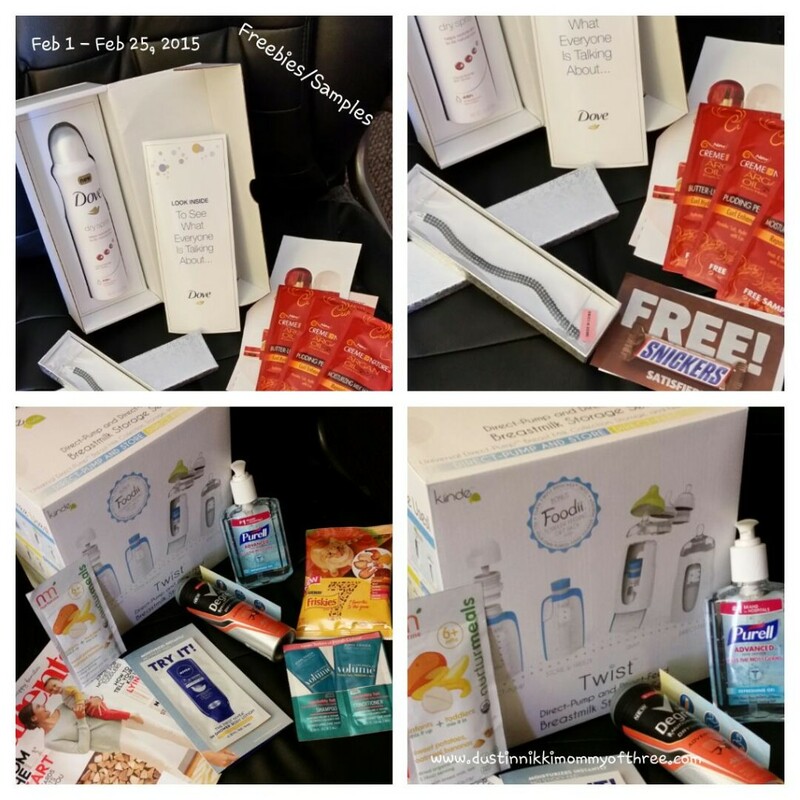 These are all the freebies and samples I received right in my mailbox February 1 through February 25, 2015. Most of them are simple fill in the form and submit while others may need a little more details. If any of them are still available, I will provide a link to them and if they need any further explanation, I will link back to my original blog post or leave a note at the bottom of this post. Free jewelry piece (bracelet, $20 value) from Liquidation Channel – I don’t believe this offer is still available. They had an offer that if you newly registered, they would send you a free $20 jewelry gift. I linked this one to my original blog post if you want to check it out and see what happens. Dove Dry Spray (full size) – Not sure exactly where this one came from but from the packaging and the brand insert, I am almost positive that this came from Dove Insider. I am a Dove insider and sometimes they have samples including full size product sample offers. Normally I get an email for them and have to sign up for each campaign/sample but every once in a while, they just send me a product to try. You can follow the link to sign up for Dove Insiders if you want to and maybe you can get some free products too. Purell Hand Sanitizer (full size) – Still available but this one is from Purell Loyalty program. If you sign up, you can do simple tasks such as sharing, watching videos etc. to earn points which can be redeemed for gift cards or Purell product. Follow the link to sign up. Purina Friskies 7 cat Food sample – Instant Win Game <—- follow this link for the original post, you can still play but it ends March 3, 2015 at NOON EST. Coupon for a FREE Snickers Bar – Snickers Superbowl Instant Win Game (no longer live).